Okay, so way back when (uhhh, January!) I posted that we were going to read the books featured in this year's Chick-fil-A calendar. And you haven't seen me post about it since then. Because, I confess, we were hopelessly stuck on January's selection. 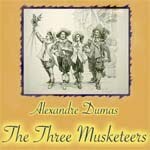 The Three Musketeers, by Alexandre Dumas. That is one long, endless book. We downloaded an audio version from Librivox. All 25 hours of it. We started listening in early February. Listened to about fifteen chapters, and debated whether or not this was something we wanted to continue. Dale listened to the rest on his commute, and he & I discussed it a bit. This certainly is not a children's book. We picked it back up, listening to a chapter here, a chapter there, but never truly attempting to seriously work at it. The past couple of weeks, though, with driving back and forth for swim lessons and science camp (which means 3-4 hours a day with everyone in the car) we took the plunge. And we finally finished the book yesterday. That only took four months. I am glad I finally know the story. Mostly we enjoyed it. One thing that can be frustrating with Librivox is that it is a variety of volunteers who read the chapters... so sometimes the names are pronounced differently from one chapter to the next. I didn't notice a lot of that though, aside from the author's name (probably half pronounced it Du-mah, and half pronounced it Du-mahs). Some of the readers were clearly more comfortable with the French names and phrases than others. But we enjoyed them all. I particularly liked the lady from Warsaw. My favorite moment this week was somewhere around chapter 65. The chapter starts off, "It was a stormy and dark night..." I couldn't help but picture Snoopy and his typewriter. What is next for our Chick-fil-A reading challenge? February's selection was Sherlock Holmes. The kids listened to one of those while driving with their father. So February is done. Salisbury in Wonderland is the title for March... so I downloaded Alice's Adventures in Wonderland from Librivox this evening. At just under three hours, that is a book I think we can finish. I don't think I would have made it through on audio book. You're making me jealous again. I wish we had Chick-Fil-A here. I just can't believe we finally got through it. What a relief! I'm visiting you from the crew blogwalk. Where did you get the calendar? I read your other post on this and then checked Chick-fil-A's website but I couldn't find anything. I know it's the wrong time of year but I would like to find one for next year. We like the librivox recordings also. I like to play them during lunchtime, keeps the kids from fussing at one another. Chick-fil-A sells a calendar every year starting maybe in November. December for sure. The sell 'em until they are out, I think, which is usually early January from what I can tell. Each year has a theme, and this year was literature. So I decided since we ALWAYS need something else to listen to, well... we were going to try to read them all aloud this year. There are also monthly coupons. Some are better than others. July's is for a free chicken salad sandwich. I need to use it still.